Our young learners love developing their skills and sharing these with others. 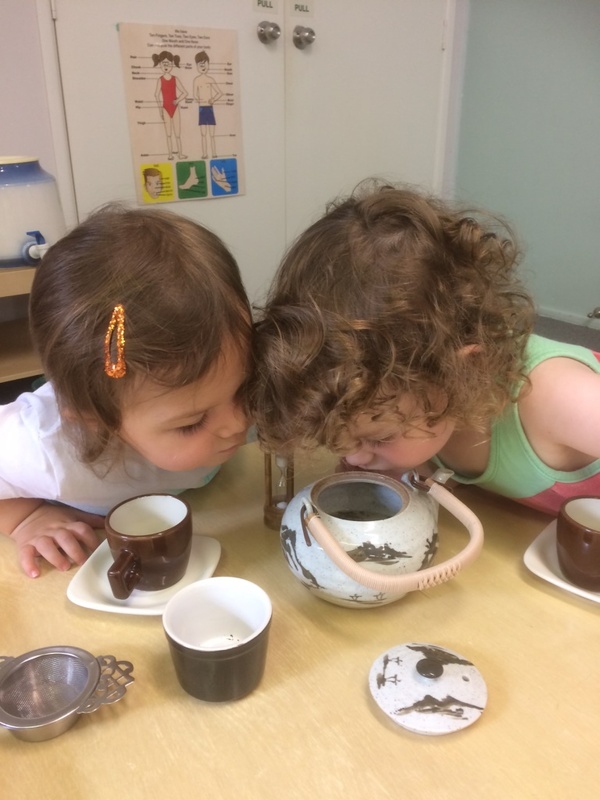 Construction of learning takes many aspects: making tea is just one preferred activity for our younger community members. There are over 30 children that every morning on different days of the week, walk into the Toddler room. They find their locker, place their bag, hat and general possessions in a personally selected space and then meander in the room with their accompanying adult. Within five minutes these little explorers find a preferred activity; for some it is eating, others art and craft and others Montessori activities. The room is filled daily with eight children and their guardian. It is a peaceful and active environment; children are given free time and space to enjoy an explicitly prepared environment and time to grow their abilities, with the guidance of caring adults. Our lovely Meg works with children and parents in the Toddler community and prepares daily, new activities to entice; at times children find exotic fruits on a shelf, to taste and continue understanding about the fruit through picture cards of same fruits to match with relevant names. These activities develop new terminology and enrich language, as well as give real sensorial experiences so important for later recall. The young student is still learning about space and time and is given opportunities to see activities that are always present, others that are changed occasionally and yet again other activities that change daily. Time itself is beginning to be understood through own sensorial experiences. An activity that is always chosen by most children is bread making; seeing the process from beginning to end and enjoying a lovely feast of fresh bread and butter or honey is all in ‘a day’s work’. This activity is completed by the toddler with some help from the parent: the child will complete the full process mostly alone, except for placing and removing bread from oven. The cooled bread is given to the toddler to cut and spread with favourite topping before eating. The satisfaction and joy displayed by the little chef is infectious and enjoyed by all in the room. This engaging little community has grown impressively in the two years it has been running and watching our toddlers prepare for their next stage of learning is always emotive and exciting. This year we have had 8 toddlers transition to Cycle 1 and in 2017 we will have 19 toddlers join the Cycle 1 communities. Having children transition from one Montessori environment to another reinforces their familiarity with the change and their comfort with activities, adults and new friends. To celebrate the transition we have a small Graduation ceremony for the child and families. Graduation Day is touching for parents and staff, but very exciting for all. Staff bring the Montessori philosophy into their home and children thrive in this environment. Little Paige, Chris Ham’s granddaughter, a 2 year old enterprising young explorer is hard at work helping dad. She has observed the actions of the adult and is imitating, feeling totally in control of her purposeful activity. Paige is very aware of workplace health and safety and following all regulations! My name is Nikki Leydier and I am the Infant Group Teacher at Caboolture Montessori School. For those who are new to the programme I will like to introduce myself a little more. I started at the school in 2003 after graduating from a Bachelor of Education- Early Childhood. I worked initially as an assistant until a teaching position arose in 2005. I taught mainly the cycle two students aged between 6 to 9 years until 2013. My two daughters, Izabelle and Shanti, also attended Caboolture Montessori School at this time. I had my son Beau at this point and returned to CMS after maternity leave as the Toddler Group Guide for two terms. I completed my 6-12 Montessori training through MWEI in January 2015. As of April 2015 I left CMS community to spend some quality time with my Husband in Canada. I am looking to immigrate to Canada later in the year, but for now I am so excited to continue the role of Toddler Guide once more for Semester 1, 2016. FYI – In the past CMS has called this group the Infant Community, but this name is for the younger child (0-15 months) and hence this is the reason for CMS to soon change the name to … ‘The Toddler Community’. What is the Montessori Infant (Toddler) Programme and how will it benefit my child? Montessori Toddler Programmes are specifically designed to cater for the child 15 months to 3 years of age, give or take a couple of months depending on the child. The Montessori phrase “Help me to do it by myself” is a perfect motto for this age group. The programmes main goals are to develop as much independence, confidence and happiness in our children. We do this by preparing an environment that caters to their developmental needs; needs which are ever-changing. This includes the providing easily accessible beautiful materials on low shelving, practical life exercises to support the child’s interactions with the environment, materials grounded in reality to support their ever growing logical mind and a rich language environment. How do I help my child to become independent? Adjust the environment to meet his/her needs. For example, choose clothing that is loose fitting and easy to put on and off. Teach the easier skill first, such as taking off the clothes. For school, choose a bag that is small enough to carry a few items. This might mean that you have some of the heavier items in your bag and lighter ones in his/hers. As your child gets stronger he/she can carry more things. Make sure your child places his/her bag in the locker and places his/her drink bottle on the tray. You want to send the message to your child that he/she can accomplish many things independently throughout the morning without your help. Only step in when you see your child really needs your assistance or if they ask for it. What if my child is not using the materials correctly? As a guide it is my role to observe and follow the child and only intervene if necessary. It is also my role to present new materials with their full cycle of activity. If a child does not use the materials as I have demonstrated then perhaps he/she was not ready for it and it will be represented at a later date. Also keep in mind that just because your child might not be using the materials as presented doesn’t mean that he/she is not gaining something from the experience. Only if a child is disrespecting the materials or others would I intervene i.e. ‘Oh Mary, the puzzle is not for throwing’. You can use the balls outside for throwing’. How should I behaviour in the classroom to support my child’s session? For the child to learn the expectations of the room it is our job as adults to role model them! If we expect the child to behave a certain way the adult in the environment must do the same, parents and teachers alike. Movement in the classroom – Always walk slowly inside. Only carry one object at a time using both hands to grasp it. Talking in the classroom – Use a quiet voice inside. Never chat socially with other parents while your child is working next to you. Use the eating area as the place to be social with other parents but again be mindful of the noise level. Reframe from praising your child while he/she is working. Food habits – Make sure you have healthy food options. Wash hands before eating. Always sit while eating or drinking. If sitting at the table with your child use a placemat and cutlery. Keep hot beverages in the kitchen. Sun Safety – Wear a hat and clothes that protect the shoulders. Materials – Carry materials with two hands. Place on a mat. Use the materials appropriately. Return the materials to the shelf. Grace & Courtesy – Greet others with a hello and remember to say goodbye. Use please, thank you and your welcome lots. It is amazing how quickly children can pick up our habits, so make sure they are desired ones. I don’t believe in forcing children to use their manners or to say sorry for that matter, as it is only in the child’s time will they develop the empathy and understanding to use these social etiquettes correctly. These etiquettes will then be more meaningful to the child. So in essences the classroom is an open space where freedom of movement and self-direction for the child are tantamount. The Montessori guide is a role model who respects all forms of “reasonable activity” with the materials and supports all manner of purposeful interaction within the environment (only intervening or interrupting in matters of safety or destructive behavior). The interactions the child has with the teacher, parent and physical environment come together to create the rich and rewarding (for all involved) Montessori experience. Can you believe it is already term 4? I can’t! This year is flying by! Term 4 brings a lot of exciting things including quite a substantial amount of our older Infant Community children starting their transitions to Cycle One in weeks 5 to 8. How exciting for our members to be so close to starting in the ‘Big Class’ with the ‘big kids’, this of course means that we will be holding a graduation ceremony for these children towards the end of term (date to be confirmed). This term we will be continuing our studies on animals, focussing for the month of October on Insects, then moving onto caterpillars/butterflies in November and then a general focus on all manner of bugs/slugs and interesting creepy crawlies in December! As we are nearing full capacity in all our sessions I would like to open up an expression of interest for operating an afternoon session this term. We would need a minimum of 5 children enrolled to operate this session. If this would be of interest to you please email me your preferred day from the choice of Tuesdays, Wednesdays or Thursdays with the session time being 11.30 to 2pm. We welcome our new families joining our community for the first time this term. Don’t forget there is the ‘Interesting Article’ folder sitting on the Pidgeon holes every day which contains a wealth of information and titbits across a whole range of Montessori and childhood developmental topics. Feel free to take copies of whatever you would like (please just leave one copy in the folder so that I can copy more). I can’t wait to see how the children will amaze and inspire me this term – they always do every single day! Join our Infant Community Programme! Montessori Infant Community Programme (ICP) differs from ‘playgroups’ because the emphasis is in catering for the child’s urge towards independence and on faith in the child’s capabilities. The ICP is a fantastic opportunity to prepare your child not only for their transition into Cycle One but for life as a whole. The ICP currently operates four morning sessions of 2.5 hours Tuesday to Friday during term time. A parent/carer attends with their child in an environment specifically set up to facilitate the child’s growing need for independence and development. The age range of the children is from the fifteen months to the time the child is three years of age, at which point the child is transitioned into Cycle One as individually appropriate. When working with children, we need to learn to give help only when it is needed and to understand the importance of standing back and observing the “unfolding life of the child before us”. (Maria Montessori). All work is set out in such a way that children can use the materials with the minimum of adult assistance and parents are made aware of the importance in allowing their children to complete and repeat tasks without interruption or interference. In this way children build up their attention span. Maria Montessori’s approach to education is essentially an “aid to life”. It is about assisting the development of human beings during their formative years and therefore goes far beyond the concept of education as in “school” or “curriculum”. In Maria Montessori’s own words: “our work as adults does not consist in teaching, but in helping the infant mind in its work of development.” Montessori believed that the first three years of life form the foundation for the rest of our lives. It is our intention to pass on some of Maria Montessori’s observations in the hope that they will enrich your life with your child. Soon, her observations will cause you to become more observant yourself and you will be able to draw your own conclusions from them, just as she did. In this way, a Montessori ICP assists both parents and children. By having this special time each week with your child in an especially prepared environment, without the interruptions experienced at home, the relationship between you and your child stands to benefit. Places are very limited so please contact Nicky at reception to book a trial session or to secure your placement for this term, term 4 and even 2016! ARTICLE: Please Don’t Call Me a Koala Bear! Welcome back after the holiday break Infant Community! It is fantastic to see your smiling faces even in the chilly temperatures of late! This term we will be studying animals. For the month of July we will be focussing on Australian animals, in August the focus will be on African animals and finishing up in September with ocean animals. The way that people always add a word that isn’t there. Than I am to a bear”. This song very much reminds me of our Infant Community in that we are quite often referred to as the ‘playgroup’. Our community being a ‘playgroup’ could not be further from the truth in my eyes. The term ‘playgroup’ often conjures up images of parents having a good ol’ catch up morning tea at a local community hall, park or such in which the children free play together often running amok! As we know our room is a prepared space designed for the children. It is their space, not ours as the adults. We are simply there to help them if they ask us to or to redirect them if indecision strikes. Our room is aesthetically pleasing, calm and ordered. It is also designed to enhance the child’s learning and development both emotionally, physically and academically. Our little ones take great pride in their work and in their classroom environment which can be seen every day by the way they conduct themselves and care for the materials. Our children are so proud and excited to come to ‘school’ and absolutely love wearing the CMS uniform. The only thing that could top coming to ‘school’ each day is to one day go with the big kids to the ‘big school’! I cannot wait to work with all of you this term as we explore this term’s curriculum and watching our Infant Community grow and develop in leaps and bounds! Don’t forget if you hear of anyone referring to us as the ‘playgroup’ to set them straight – or ask your little one to tell them all about school which should do the trick! Welcome back to all parents and children after a refreshing holiday break! Term 2 holds many new exciting things for the infant community. The first 2 weeks of term will see us focusing on the ANZACs and Australiana before commencing this term’s theme of the Environment. Each week we will explore a new topic wrapping up the term participating alongside the rest of the school community with Environment Day activities. As mentioned in the school newsletter, CMS will be participating in the Caboolture Anzac Day Parade on Saturday 25th April. It would be so special to have our youngest students (us!!) participate in the parade alongside the rest of the school. So please come along and join me, just notify the office that you will be participating – the more the merrier! Class numbers in the infant community have reached all time highs with capacity numbers in each session. We would like to open an afternoon session (likely 11.30 – 2pm TBC) one day each week. Minimum numbers to operate this session apply so please contact the office to register your interest and state which afternoon you would prefer (Tuesday to Friday). Last but not at all least, I’m sure you all join with me to wish Nikki our fabulous directress good luck with her adventures in Canada – we look forward to reading postcards of your tales in the near future! For those of you I haven’t yet had the pleasure of meeting, my name is Amanda Simpson and I will be stepping into the shoes of Nikki as the new Infant Community Directress. I have been a part of the infant community here at CMS for quite some time – both as a parent and as a student undertaking my teaching practice. When my then 15 month old daughter and I first attended the infant group program it ran for only one day a week with just two students – what a far far way it has come! We have evolved from a simple ‘playgroup’ to multiple sessions of a formal class structure aimed at assisting our youngest students build their independence to eventually graduate and transition to the much revered Cycle One with the ‘big kids’!! I look forward to all the experiences we will share together in this new term! I am very happy to see our quiet sessions now overflowing with new faces. Welcome to Catherine, Cassidy & Cooper and welcome back to Natasha, Eva and Carlos. With a change of season come many colds and flu and over the past couple of weeks there have been many unwell children at CMS. To ensure that these bugs are not spread around, if your child is unwell can you please keep them at home. As well as stopping the spread of germs to other children, parents and staff, your child will probably feel best in the comfort of his own home. Your child’s ability to concentrate will be hindered by his sickness. Zinc is a very important mineral to boost your child’s immune system and in turn keep the bugs at bay. Did you know that you can buy liquid zinc from the chemist and perform a simple test to see if your child is low in this mineral? At the beginning of the month I purchased some new materials for our classroom. I am so excited to share these with you and your child. Some materials have specific lessons, such as the cylinder knobs, so if your child is showing interest in them, let me know so I can present this to them. Most days in the infant programme are now at capacity and there has been an expression of interest to open up a second session on Friday afternoons, which would run from 12:00pm to 2:30pm. We would need at least 4 or 5 students to run this session. If you are interested in enrolling please come and see me before the end of term. However, this session may only run for one term due to our numbers decreasing due to mid-year students graduating into cycle one. I will be running a session on Monday the 30th of March, for those students who usually attend the Friday session, as Friday the 3rd of April is GOOD FRIDAY and therefore a public holiday. Does anyone have a room divider that they could donate to the infant community? I would like to hide the computer in the corner. Also to tidy up my shelf above the cupboards does anyone have any spare large plastic tubs that they no longer need? Lastly fresh flowers are always a lovely addition to our classroom and a beautiful practical life activity for the children. If you have flowers in your garden we would love some for the programme. The child whose attention has once been held by a chosen object, while he concentrates his whole self on the repetition of the exercise, is a delivered soul in the sense of spiritual safety of which we speak. From this moment there is no need to worry about him – except to prepare an environment which satisfies his needs, and to remove obstacles which may bar his way to perfection. Maria Montessori. The Absorbent Mind. The environment should provide ample opportunity to perform practical life activities such as washing dishes, sweeping floors, scrubbing tables etc. Observe your child and follow his interests. This means allowing him to make true choices that are not influence or directed by you. When you arrive in the class merely observe where his aspirations take him. His interests will capture him…if only for a few minutes in the beginning. This early focus will gradually increase if the child is given the respect to follow his own wishes and will. When your child is absorbed in experiences, don’t at any cost interrupt him by commenting, asking questions, moving about or simply conversing with others around you. Only interact with your child when he looks at you or similarly when his concentration has wavered. A simple smile or a comment on what he has done is enough at this time i.e. ‘You finished the puzzle’. He may also need role modelling to pack away his materials. Depending on his response this sometimes will mean you have to pack away for him. Let your child repeat activities as much as he likes. If your child wants to wash dishes or view the same book over and over allow this to happen, as this is when concentration is strengthened. Avoid screen time of any kind and let your child spend lots of time in nature! Television, smartphones and other technological devices may seem to hold your child’s attention, but this is not true concentration. The constant changing of images is not conducive to normal brain development of the frontal lobe. It affects the child’s ability to learn and prevents the child from working sensorially with his hands and mind in unison. Concentration does not always ‘look like’ sitting still and working contently. There are many gross motor tasks that are engaging to the young child i.e. climbing a tree, building a tower, painting a picture etc. Observe your child. What captures and holds his attention? Provide activities that interest him. For example… If he seems to enjoy pouring water from one glass to another, provide a transferring of water activity. Make sure the materials that he uses regularly are well kept, accessible and ordered. Be a good role model. This means allowing your child time to observe you work with concentration. And this does not mean using a smartphone or other technological device. Children grow from, watching mum and dad perform their normal household duties. These activities show consistency, familiarity and hard work. You are building subconscious memories of what ‘normal’ looks like and surreptitiously building a view of ‘work ethics’. Observe your child’s rhythms of activity. Provide opportunities for outside gross motor activities when he shows the need to be physical. Whole body movements are very important in the development of your child’s brain. Lifting heavy objects and moving them from one spot to another is a great physical exercise as well as neural development. Plan quiet and calm time each day to address your child’s needs of a growing individual. There is phenomenal work happening in this person! Quiet activities could include yoga, meditation, listening to relaxing music, going for a quiet stroll, sitting in a favourite part of the garden or simply reading a book together. As your child grows, his concentration can be strengthened and supported just like any other area of his development. You can be supporting this process by working with your Montessori class director and by providing your child an environment that fosters concentration. The CMS staff and I, Nikki Leydier, are pleased to welcome you to the 2015 school year at Caboolture Montessori School. I hope everyone had an enjoyable holiday and are excited about the school year ahead. I would like to welcome back our families returning and hope to see some new faces this year too! I would like to introduce myself first for those of you who are new to our school. I have been working at CMS since 2003, where I first started as an assistant and then went on to work for many years as a directress in cycle two. My two daughters also attended CMS for all of their primary school years. I recently completed a Graduate Diploma in Montessori Education (6 to 12 age). Since having my son in November 2013, I have been very interested in learning more about Montessori for the 0 to 3 aged child and hence was thrilled to take on the position as infant community Guide. I truly appreciate you trusting our Montessori Programme for your child and I humbly accept the responsibility. Independence is one of the primary goals of Montessori teaching and our curriculum is revolved around that. With your support I am committed to bringing out the independence that is within your child. I will help to do this by setting up an environment that encourages your child to do as much for himself/ herself as possible. I will also role model ways to encourage independence throughout the school day and will give suggestions for supporting your child in the home environment. CMS also has a parent library with many books and DVD’s for you to loan out. As a passionate Montessori teacher I am dedicated to providing the most ideal environment for the child to foster their development and support their individual needs. Montessori observed that children aged 0-3 have a very strong desire for order in their physical environment, so as much as possible there will be set areas for different work and I am very happy to discuss these in person. The 0 to 3 aged child thrives on a rich language environment so I will also be providing many language experiences/activities to support your child’s expanding vocabulary and communication skills. In many instances, this is the first experience the child has of being a member of his own “society.” The child is encouraged to be a functioning member of this society, thus leading him to a feeling of pride and dignity. Waiting one’s turn, sharing, and patience are important lessons that each child learns. I would also like to take the opportunity to advise you that Amanda Simpson, Savannah’s mother, is completing a teaching practicum in the Infant Community this term. She is currently studying the Infant Course through Montessori World Education Institute. Due to children from the infant programme moving into cycle one this year we have many spots available on all days if anyone is interested in attending more sessions. Also, please feel free to let your friends & family with young children (aged 15 months – 3 years) know we have vacancies. It takes many people to run an effective infant programme and I look forward to working alongside you as the child’s first teacher, to bring out the very best in your child. The Infant Community started in 2013 with 3 children under the guidance of Angie Douchette and through her hard work and commitment grew considerably. Angie unfortunately left to welcome her second son into the world. The class is now prepared by our lovely Nikki Leydier and numbers have again increased. 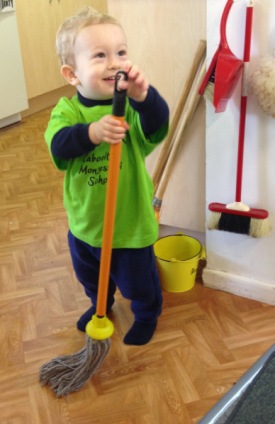 We now run a small community of 24 children between the ages of 15 months and 3 years. The interaction between class guide, children and parents is providing a wonderful didactic and nurturing environment for all to learn together. The young child is going through a phenomenal physical transformation and less obviously developing neurological connections to make sense of their world. Dr Montessori refers to this child as a spiritual embryo: changes are mostly happening subconsciously and grow exponentially due to the individual absorbing all events, concepts and experiences and storing these in memory for later application. The environment prepared for these children considers the stage of development, the needs of the learner and family and the culture that envelops this community. It is a safe space where love, attention to detail, order, movement and richness of language are manifested through adult guidance and student independence. When we talk about graduations we generally have visions of students leaving high school and entering a totally new journey of life. However, in the last week of the 2014 school year, we had a very special graduation at Caboolture Montessori School. We celebrated with some smiles and tears our children graduating from our Infant Community to Cycle 1, the very first cohort moving from the Infant Community to cycle 1. Our graduates have completed one or two years in a community of children between the ages of 15 months to 3 years old. The children celebrated completing activities developing motor coordination, independence, social skills and enriched communication strategies. The parents celebrated the learning they experienced with their child in a safe and nurturing environment and the networks built in the time they participated to the group. The staff of CMS want to salute children and families for completing the first stage of the Montessori learning journey and wish the children all the very best in cycle 1. Congratulations!